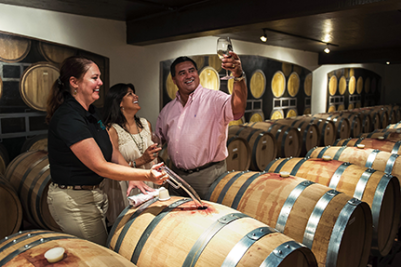 Fredericksburg is your gateway to one of the most robust wine regions in the country – The Texas Hill Country. More than 20 wineries and vineyards in the Fredericksburg area offer award-winning varietals including cabernets, tempranillos, viogniers and rieslings. But what will really have you coming back for more are the creative blends each winery perfects, truly setting them apart from each other. As an added plus, Fredericksburg is an easy drive to all of them – your perfect "home base." Enjoy spectacular views while you sit and sip. Step beyond the tasting room and go behind the scenes on a barrel room tour, or sign up for a more in-depth and private tasting seminar with the winemaker. Not afraid to get messy? Then watch the calendar for grape stomps, a popular event held at many wineries in the area at the end of harvest season in August. There&apos;s just no way this is a day trip anymore. Which is why Fredericksburg offers over 400 B&Bs, guesthouses and inns and 24 hotels/motels. The only way to make a trip to the Texas Wine Country better is more time to enjoy it. Find the lodging that&apos;s perfect for you; a rustic country cabin, a 1940&apos;s themed hotel, or an upscale loft on Main Street. Or even a larger guesthouse accommodation for a group of friends. Break up your tasting visits with some shopping, gallery hopping, fine dining and history! Fredericksburg is a shopper&apos;s paradise with over 150 unique shops, art galleries, boutiques and restaurants lining the historic district of this German-Texan community. You&apos;ll find creations by artists working in metal, glass, oil and watercolor. Handmade jewelry by local artisans. Women&apos;s fashion ranging from vintage and hand-sewn to upscale contemporary. A staggering collection of sophisticated home décor. Antiques, Western wear, and Texana books. Right in the middle of all the shopping is The National Museum of the Pacific War, a state-of-the-art walk back in time to one of our history&apos;s most epic battles, featuring interactive exhibits and audio tours. A museum so thorough and visually captivating, your ticket is good for two days! As you can see, the choices are endless – so is the fun! Call 1-866-997-3600 or visit www.VisitFredericksburgTX.com to plan your next Hill Country getaway.